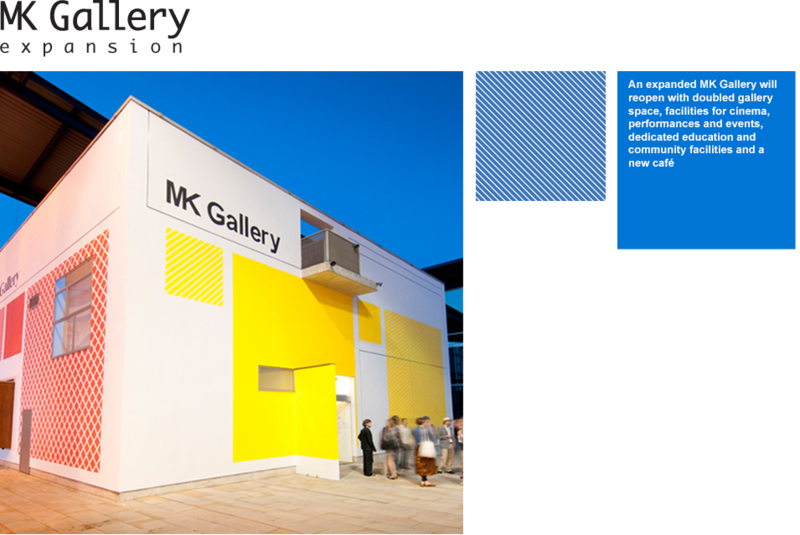 Image: MK Gallery expansion visualisation. Image courtesy of 6a architects. This autumn, major construction commences on MK Gallery’s ambitious expansion. This will see the current building double in size and the creation of new cultural facilities in Milton Keynes. Reopening in 2019, the Gallery and its programmes will be transformed through doubled exhibition spaces for historical as well as contemporary art, a multi-purpose auditorium for film, music, dance and other activities overlooking the city’s green spaces, a dedicated learning and community space, excellent access facilities and a welcoming new café bar and shop. Working on an exciting design by 6a architects, the expansion is being delivered by main contractor, Bowmer & Kirkland with project management and contract administration by Jackson Coles. Through extensive consultation with local residents and stakeholders, the design has been refined in partnership with MK Gallery, Milton Keynes Council, and Arts Council England. Award winning 6a architects has garnered a reputation for its sensitive and engaging buildings. The design for MK Gallery includes references to the original development of Milton Keynes in the 1960s and 70s telling the story of the city’s visionary heyday, in collaboration with artists Gareth Jones and Nils Norman. The expansion of MK Gallery has been made possible with the generous backing of Arts Council England, Milton Keynes Council, SEMLEP and many other generous trusts, individuals and businesses. The funders recognised MK Gallery’s track record in delivering excellent and innovative local and international arts programmes, particularly praising its partnership working and success in bringing new audiences to the arts. Throughout construction, MK Gallery is delivering City Club, a programme of new art, performances, family activities, happenings and talks inspired by the original cultural plans for Milton Keynes. Further details can be found at www.mkgallery.org.